Baking a batch of lasagna isn’t that hard. With the right set of tools and ingredients, you can easily create a fine batch or two of this hearty pasta dish. 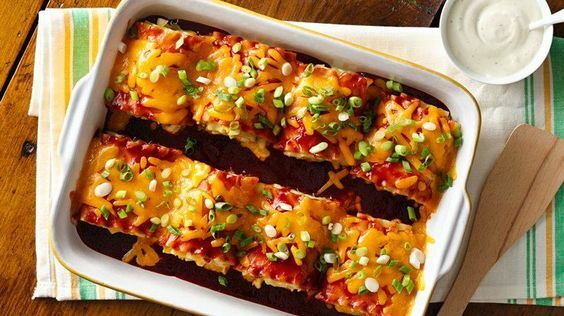 One thing that you should always have at your disposal when it comes to baking lasagnas are lasagna pans. Having a reliable lasagna pan in your kitchen will allow you to create perfectly cooked lasagna that will be able to hold itself up after removing it from the pan. If you are currently looking for a nice lasagna pan that you would like to use at home or give as a gift, then I suggest you continue reading this article for it will contain all the information you need to know when it comes to buying lasagna pans. 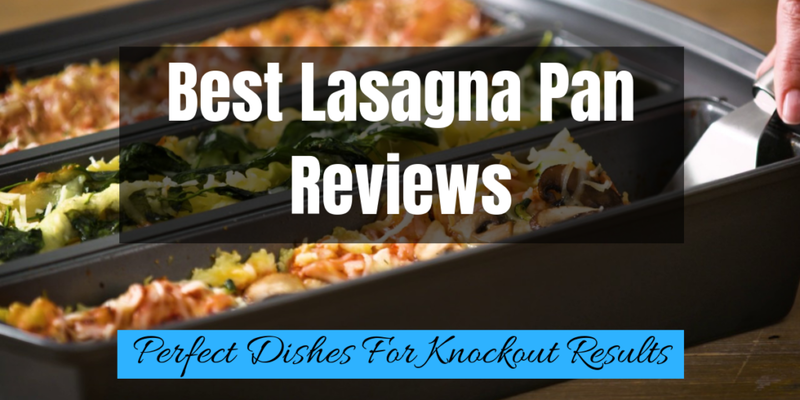 In this article, you will learn about how to choose a lasagna pan, how to make classic lasagna with it, and a list of the 5 best lasagna pans that you can buy online. Find out which pans can offer durability and ease of usage. You can find a plethora of recipes on how to make lasagna out there but it’s important to know what not to do so you don’t end up with dry or even soggy lasagna. 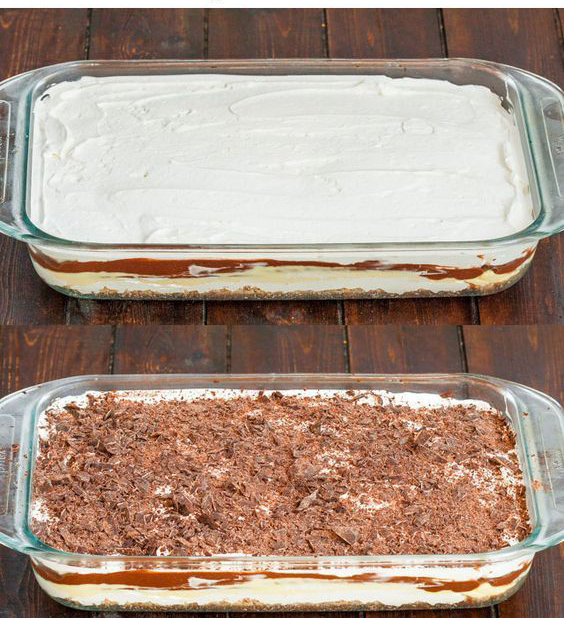 You would want the layers to be firm and you would want to ensure that you get the ingredients properly layered to get a good balance in your lasagna’s structure. 1. Choose a good pan. Generally, you would want to pick something that has thinner materials but has more depth to it, so you can build your lasagna layers easily. A thinner material will also make the end result moister. 2. Make your own lasagna sauce. Steer away from those prepared sauces that might not have a lot of fresh flavors and might even come with tomato paste. They are generally used to make the sauce thinner, but they do tend to make the lasagna a bit soggy. Try slow cooking your own lasagna sauce because it will make a whole world of difference to how your lasagna will taste. 3. Use pre-cooked and pre-seasoned meat. In fact, consider using your leftover roasted or grilled meat. They are already loaded with flavors, so they should infuse more flavors into your lasagna compared to just using ground meat. 4. Make your ricotta thicker. Put a clean cloth on a small colander and drain your ricotta in here. This will help get rid of the excess oil that will surely make your lasagna soggier. Just leave it there for a few hours to drain naturally. You can also stir it to help it expel water. When you are ready to make your lasagna, form the ricotta in a ball using the clean cloth and wring out the excess water. Experts also suggest adding a bit of lemon juice and some salt to the cheese. This will actually help “ripen” the ricotta, which will make it less watery. 5. Pre-cook your lasagna sheets. If you are making your own lasagna sheets, make sure they are a bit thinner than the ones you can buy from the store. Pre-cook them so they are easier to bake. If you thought all lasagna pans are the same, you are mistaken. You’d be surprised at how different the outcome is when using different kinds of pans. This is why you need to choose the right one based on size, thickness and quality of materials if you want to end. The first thing you should look for is the shape of the pan. Try to use a pan that comes in a rectangular or square shape. Getting a pan in this shape would allow for seamless layering and slicing. The second thing you need to be mindful of is the height of the pan itself. Since lasagna usually comes with 4 or more layers, it’s ideal to go with a pan that has a height of 2 inches and above. But if you really want to get a lasagna pan that can be used to make large and small lasagna, I suggest you get one that is 4 inches in height. Take note that a 5 inch by 8 inch rectangular lasagna pan will be able to provide you with a small batch that’s good for two people. So if you are planning on using the lasagna pan you are getting to prepare lasagna for a large group, you better get something that’s about 12 inches or above in length. As for the material, I think it really depends on your personal preference. Metal lasagna pans tend to conduct heat very well and are quite light to carry. They are also very durable. Pyrex lasagna pans on the other hand, are much more attractive. The pyrex glass is also very easy to clean since you don’t have to worry about scratching off any coatings. Pyrex glass tends to be more fragile though, but it can be a good investment to serious home cooks. It’s just less of a hassle to work with. You don’t have to bother placing your lasagna in another dish for presentation, you don’t have to put in much effort when it comes to cleaning it, and you can even use it as a means of food storage because it doesn’t leak flavors onto your food. Lastly, try to look for a lasagna pan that is easy to clean and easy to handle. 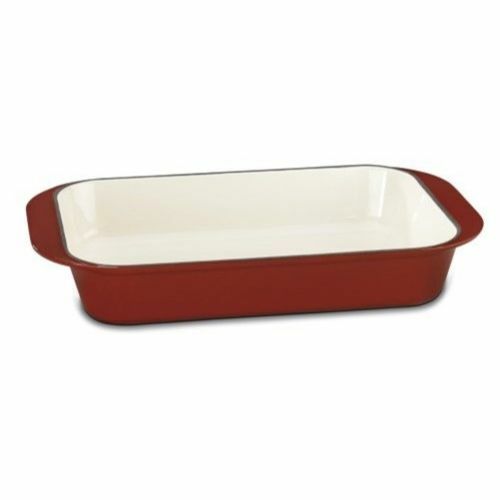 Go with a lasagna pan that has a glossy finish for easier scraping or wiping. You may also want to look for a pan that’s dishwasher safe. Also try to go with a lasagna pan that comes with ergonomic handles that you can grip even when you’re wearing ﻿﻿oven mitt﻿﻿s. Pyrex is a well known brand that has been living up to its reputation for more than 80 years. 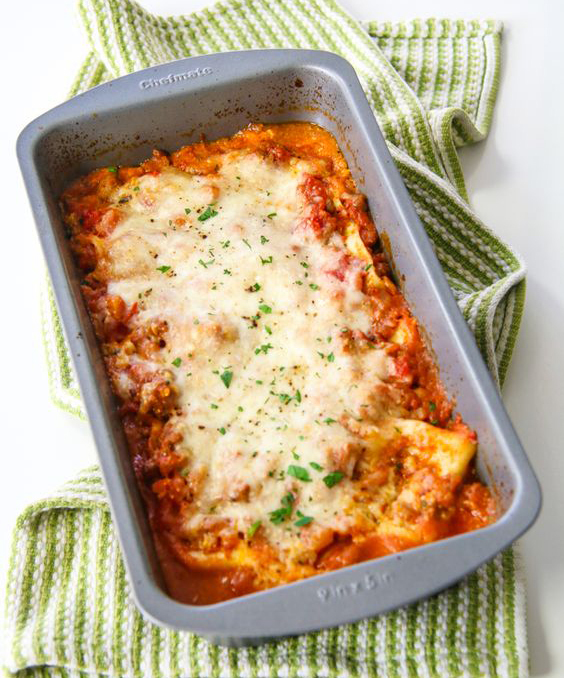 What makes this Pyrex pan the ideal choice for baking lasagna (or any other type of food for that matter) is its highly durable material that is able to withstand high heat temperatures. In fact, Pyrex glass is one of the least likely glasses to break from temperature changes. 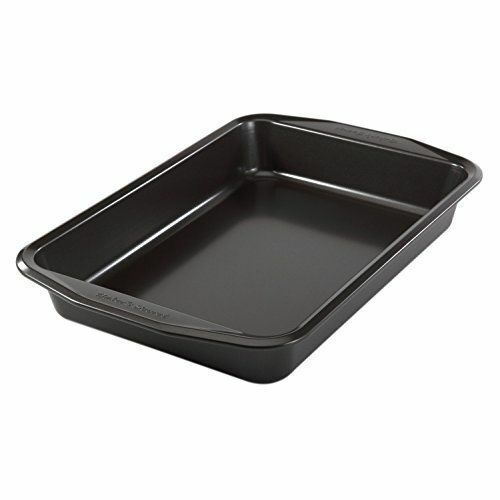 This Pyrex lasagna pan is also good for storing your leftover lasagna since it can be placed in the fridge after serving. You can also reheat your lasagna in the microwave or oven while it’s still in this pan. And after using it, you can easily clean it in the dishwasher. This classic looking stainless steel roaster can be used to make a large 16-inch lasagna. What I like about this pan is that it is made of highly durable stainless steel. Aside from being durable and easy to clean, the stainless steel material that this pan is made of allows for a lighter weight as opposed to glass and cast iron pans. It also has an attractive look that makes this ideal for using as a serving dish. Another thing that I liked about this pan is that it’s very easy to clean. You don’t have to be cautious when cleaning it because there aren’t really any coatings to scrape off. Besides, it’s completely dishwasher-safe. This oblong rectangular pan has got to be one of the easiest to clean in this list. This lasagna pan comes with a handy non-stick coating that doesn’t only allow less menial cleaning, but easy food release as well. It’s even metal spatula safe! However, what I liked best about this pan is that it comes with large contoured handles that you can easily grasp even when you are wearing oven mitts. It has a highly ergonomic design that just allows for easy maneuvering. 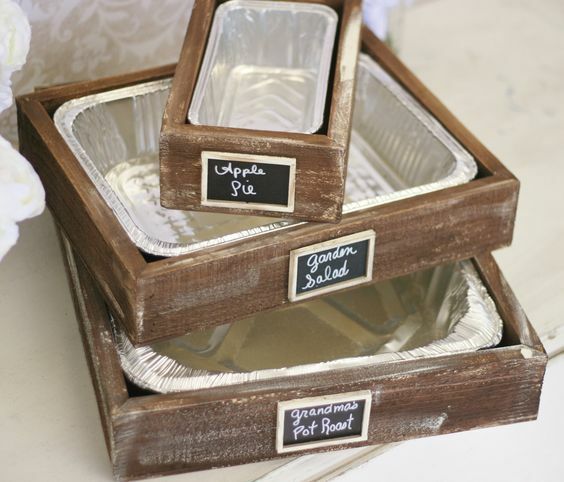 Which is very important since you will be carrying a heavy load of piping hot food if you cook lasagna in it. What’s more is that this lasagna pan is completely dishwasher safe and it comes with a handy lifetime warranty. This beautiful Cuisinart Chef’s Classic lasagna pan comes with a nice 14-inch length that’s just ideal for preparing large batches of lasagna for the whole family. It comes with a porcelain enameled exterior that makes it terrific for serving. If you are impressed with the looks of this pan, you’re going to be more impressed when you find out what’s underneath it’s exterior. It comes with a cast iron interior that is known for retaining heat very well. 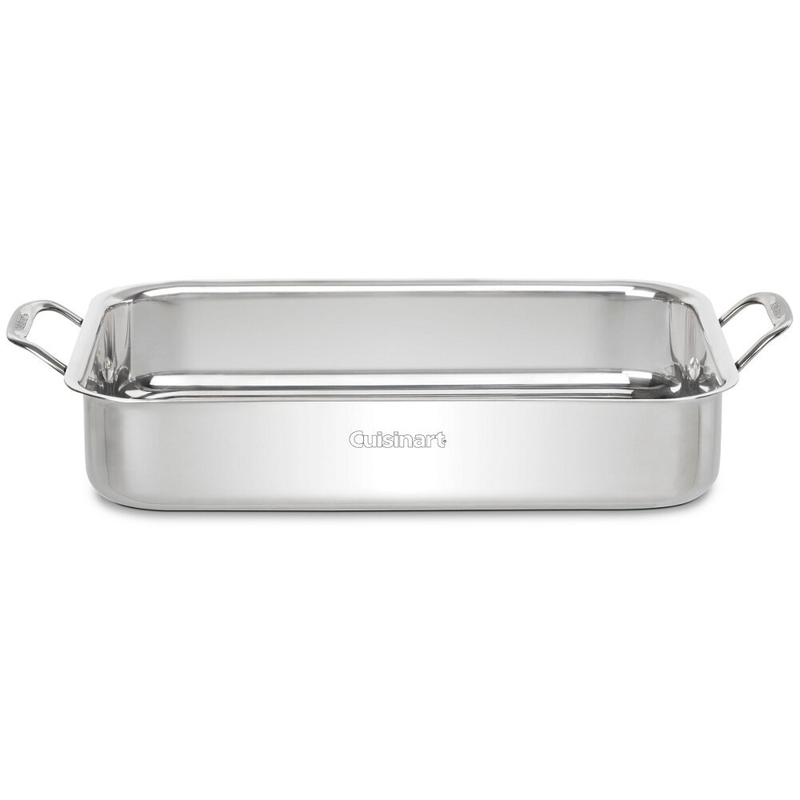 This Cuisinart lasagna pan is another durable and light product on this list because it is made of stainless-steel materials. It comes with a mirror finish that makes it look quite presentable and ideal for serving. It’s very much like those pans you see caterers use for serving. What I like about this pan is that it comes in a standard size that fits most ovens. It also comes with nice riveted side handles and a handy stainless steel roasting rack for added ease of use. Needless to say, this pan is ideal for baking lasagna, Au Gratin potatoes, and casseroles. 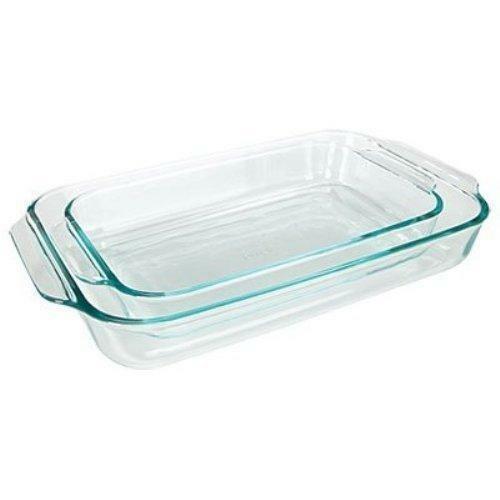 If you hate having to transfer your lasagna or you just want something that you can present with ease, the Pyrex Basics Clear Oblong Glass Baking Dishes is a good option for you. It is easy to use and is even easy to clean, great for home cooking. The Cuisinart Chef’s Classic Stainless Roaster is great if you often make big batches of lasagna or other foods. It has a nice size suitable for making party foods and even comes with an attractive design, perfect for serving. If you are looking for something that ensures your lasagna will be released easily from the pan, the Baker’s Secret Signature Oblong Rectangular Pan is a sterling option. It is also a good size for everyday cooking, so it should be easier to use in your kitchen. Go for the Cuisinart Chef’s Classic Enameled Cast Iron Lasagna Pan if you want something that can cook your lasagna evenly. The cast iron inside will ensure that there are not hotter or colder spots, ideal for making the best-tasting lasagna. You can also easily take it from the oven and serve it on your dining table because it looks great. Our number one option for the best lasagna pan hasn't been easy to determine, however after taking everything in account we've decided to award that honor to the Pyrex Basics pan thanks to its affordable price and impressive performance. 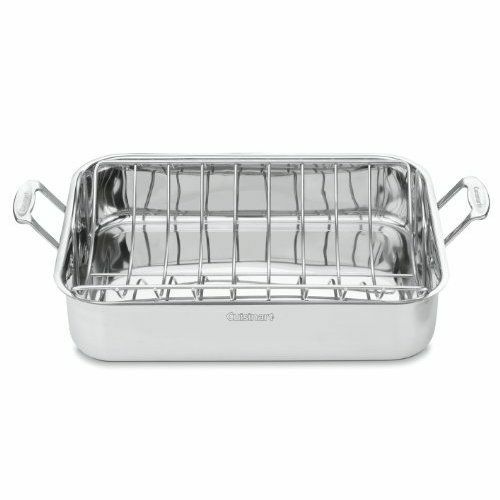 You would want to choose the Cuisinart Lasagna Pan with Stainless Roasting Rack if you also plan to use the pot for roasted dishes. It’s a great investment if you want something more flexible and more useful in the kitchen. Aren’t these pans beautiful? You will find more beautiful kitchen products to buy from our homepage. Check out our recommendations on the best and the most reliable products.